Back in November 2014 I came to Patra, Greece, for the funeral of my mother. Father Andrew at my mother’s parish church ushered me into the sanctuary and gave me vestments to wear so I could preside at my mother’s funeral service. So there I was, a clean-shaven priest from America between two local priests, both sporting typical long beards. Not for one moment did I feel out of place. The funeral service was followed by a procession to the cemetery where the burial took place. There I encountered Father Mihalis and another priest, who preside at gravesite services. When they learned that I was a priest, they immediately insisted that I do the gravesite service. I didn’t have a book with me, so I went from memory, and they helped when I stumbled on a word or two. Again, a study in contrast, and again total acceptance, accommodation and priestly fellowship such as I have never encountered back home. The two cemetery priests in 2014. Father Mihalis is on the right, with white beard. Today I was back in my mother’s home parish for morning Liturgy. At the end of Liturgy we had a memorial service for her. Father Andrew was as kind as in 2014, though I chose not to put on vestments and participate in the Liturgy and memorial prayers. 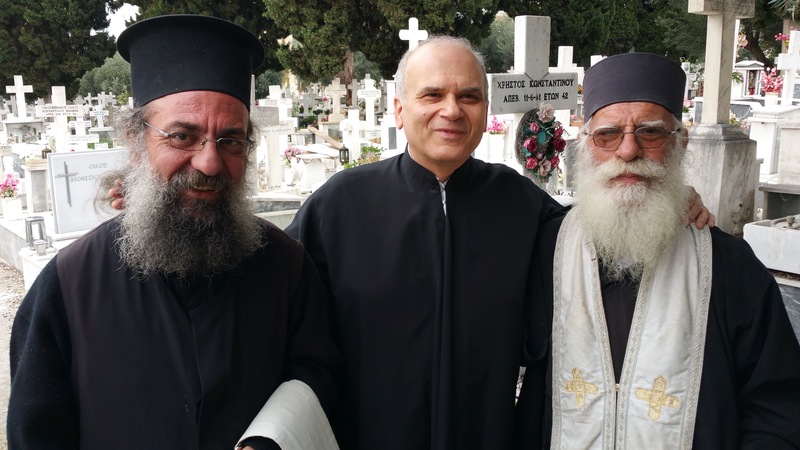 Later in the afternoon we drove to the cemetery, and there was Father Mihalis making his rounds. I immediately accosted him and asked him to come to my mother’s grave. He showed some signs of recognition. I took out my iPhone and showed him the pictures of the Nov 2014 gravesite service. We started walking to my mother’s grave and he began to introduce me to other people that we passed. I at one point told him to stop doing that, and he was surprised. Why are you nervous? You’re an Orthodox priest and it’s a blessing for people to know you! A woman went to kiss my hand – something very common among Orthodox people – and I pulled back. Don’t be like that, he gently said to me. I completely surrendered to his loving care. Both in 2014 and today I worried that people would think less of me because I’m from America, clean shaven with short hair, looking nothing like a Greek Orthodox priest. And yet not a single person in 2014 or today even remotely looked at me with any disapproval. So who was more caught up with external appearances – I or Father Mihalis and the people he was introducing me to? The answer was clear! Father Mihalis is very special. He is an ordinary saint. I couldn’t stop embracing him today. The church canonizes extraordinary men and women and calls them Saints. They might be martyrs for the faith, ascetics and great spiritual masters, renowned bishop theologians, etc. Father Mihalis is not extraordinary in any of the usual senses. He is a simple cemetery priest, making his rounds, responding to every call to go to a grave for a prayer service, and humbly accepting whatever small payment he might receive for his services. His priestly garments are old, worn out and not recently cleaned. His hand are brown from the sun and from handling incense and being close to the earth at every graveside. If Jesus were walking around the cemetery today, he’d probably look a lot like Father Mihalis, but probably younger and with a shorter beard. He wanted to get vestments for me so I could do the service. I told him, No, I wanted him to do it! When we finally got to the graveside, where my wife and aunt were waiting for us, he immediately included all three of us and even pointed to me to do some of the priest’s prayers, though I was dressed in regular street clothes. Such a spirit of openness and inclusiveness I have never encountered in America. And here I was in conservative Church of Greece and I’ve been blessed to have experienced the love and welcoming spirit of Christ in the persons of Father Andrew and Father Mihalis. They are true priests in the service of Christ, not of worldly appearances. Today with Father Mihalis I felt in the presence of a saint, an ordinary saint. We need more ordinary saints in the church. They are the poor in spirit, the pure in heart, the meek who will inherit the earth. Which earth? The earth that Father Mihalis touches in his gravesite services and in which he will join his wife Ismene who died this past January? Or the earth that can still be made holy by men and women like Father Mihalis? I pray that he will continue to make the rounds of the cemetery for many years so I can meet him again and be touched by his gentle spirit. Categories: Uncategorized | Tags: inclusiveness, openness, Patra, priestly appearances | Permalink. We are in Greece for a long overdue vacation. We stopped in Germany on the way to Greece to visit some friends. My German vocabulary consists primarily of lines from the Wagner operas. Not exactly useful when traveling in modern Germany. So I find myself in the position of most tourists – in a foreign country where I, like almost all Americans, do not know the language. It is customary when traveling abroad to ask, “Do you speak English?” And that’s what I have done in previous trips abroad. Something strange happened in this trip, however. From the very first situation in Frankfurt, I found myself asking, “May I speak English?” It surprised me that I asked the usual language question in this manner. And I said to myself, there’s something right about it, and I continued to ask the same question in all subsequent situations where I needed to ask someone for help or directions. “Am I redundant yet?” That’s the question a man we met at Frankfurt airport asks his boss in London with hope for the day when the answer will be, “Yes.” That will mark the day when he can retire, when he becomes “redundant”. So he asks his boss on a regular basis if he is redundant yet. I love the concept, and I love the question. It’s the deflating question par excellence. We all want to feel needed, that the world revolves around any one of us. To feel redundant is the answer to all the self-importance we impose on ourselves. And it is an imposition, a burden. To feel redundant is a more accurate indicator of our standing in the universe. The two questions represent what I’m not on a daily basis, and they both hit me at the same time – one coming from my own better innards, the other coming from a Londoner looking forward to retirement. How often do we really think about the words we use? And how do our words often reflect underlying, deep-seated inherited attitudes about the world and people who are not like us? How often do our words reflect an underlying imperialist attitude? But when I ask, “May I speak English?”, I’m placing myself in the position of lacking something. I am making myself redundant! I am expressing my own lack of knowledge. I am renouncing my imperialist expectation, and I’m asking the other person permission to speak my language, because I don’t know any other, in the hope that he or she will help me in my ignorance. There’s a world of difference in how I ask for help. Do I place the focus in the other person and what I expect or hope for in the other person; or do I place the focus on my shortcoming and need? Above all, asking “May I speak English?”, also represents respect for the country where I am traveling and the people of that country. I don’t think most people who ask in the customary way are showing disrespect and most people would say I’m overthinking this matter and drawing too many implications that most people can’t relate to. That’s probably true. But I’ve become so sensitive to matters of imperialist pretensions and inherited attitudes that it’s natural for me to overthink something so basic as how I ask for help in a foreign country. Maybe I’m overthinking, but too often we don’t think enough! Maybe I’m overthinking, but too often we don’t think enough, because we are so important. That’s where the Londoner’s question comes in. Redundant is the antidote to self-important. So yes, let me be redundant. And may I speak English in my redundancy? Categories: Global Visions | Tags: arrogance, global consciousness, humility, self-importance | Permalink.